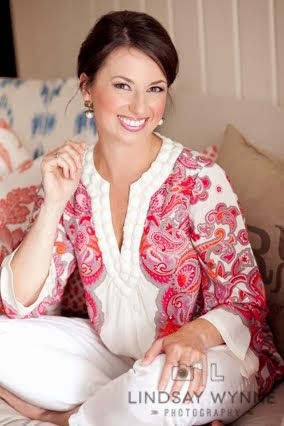 Thank you all for such sweet comments on my last Easy Weeknight Dinners post ... I want to know who tried the mashed white beans with rosemary! Today I'm bringing to you today two more recent dinners I made. And I'm REALLY excited to share with you a common trait of both of these dinners. Lean in, girls ... because this is a good one. 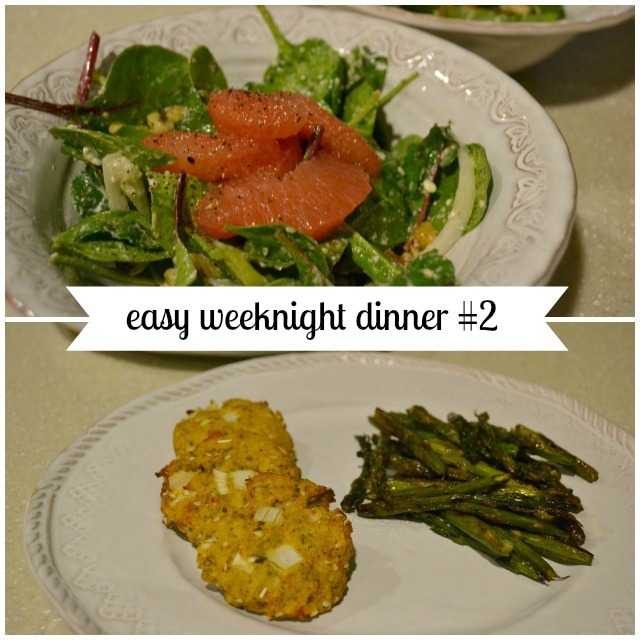 Both dinners contain veggie sides that my husband previously disliked. 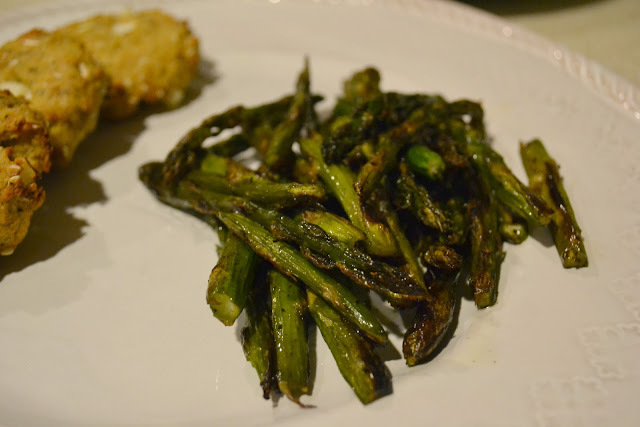 Broccoli and asparagus. And I found the secret to make him love them. AND ask for seconds. The secret is this: Toss the veggies with just the teeniest amount of olive oil, salt, and pepper, maybe even a light spray of cooking spray -- roast in the oven at 400 degrees. Once brown and crispy, remove from the oven and (here we go) drizzle with black truffle oil. Now, without further ado... dinnertime, ya'll. Chicken Piccata is hands-down my favorite meal. I like using smaller chicken tenderloins for this. Just toss them in flour, brown on both sides in a pan with some hot olive oil, remove from the pan and keep warm. Add in to the hot pan 1 cup of chicken broth, some lemon slices, and a few capers. Swirl together, reduce, then pour over the browned chicken. 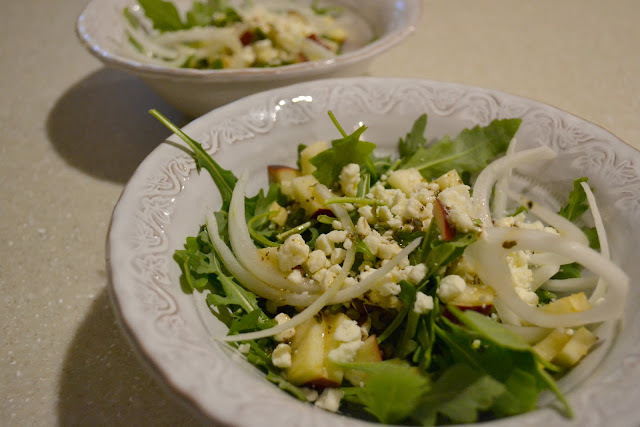 The broccoli was made using the "make my husband worship my veggies" method above, and the salad was an easy mix of mesclun greens, sliced onion, diced red apple, fat free feta cheese, and a homemade lemon vinaigrette. I'm seriously still in awe remembering how Ian was chowing down that broccoli. I purchased my black truffle oil at Homegoods, and I swear I could consume it by the spoonful. This was truly a yummy meal! 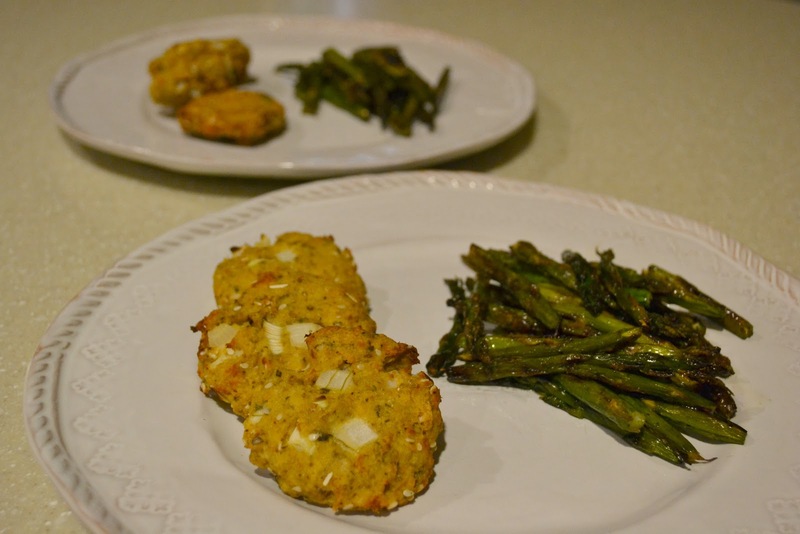 Salmon cakes are a little retro, no? I know the thought of canned salmon may not appeal to everyone, but for this recipe I'm totally okay with it. I just remove the salmon meat from the can, remove any bones, and toss it right into a big mixing bowl. Into the bowl goes an egg, a sprinkle of Italian breadcrumbs, and then seasonings of your choice. For these, I used chopped onion, sesame seeds, oregano, salt + pepper, and a little Dijon mustard. As long as you have the egg and breadcrumbs, you can virtually add anything else you'd like! Then just bake or pan-fry until done. The salad was delicious. So delicious. In a bowl, I added feta cheese, olive oil, and lemon juice -- whisked it all together until it became a feta vinaigrette. 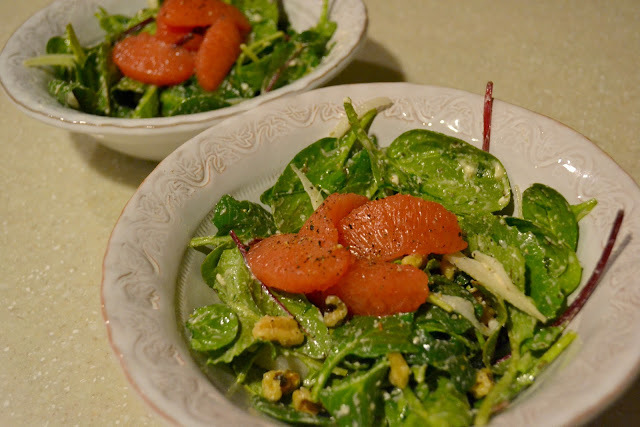 Then I just tossed in spinach, onion, and walnuts ... tossed it, finished it off with some red grapefruit segments and cracked black pepper. The grapefruit was from one of those single-serving plastic cups (Dole maybe?) which was an awesome timesaver. There were several more salmon patties and Ian ate them all. I often make dipping sauces for them -- a little mayo and dijon mustard is really all you need to make a great sauce. 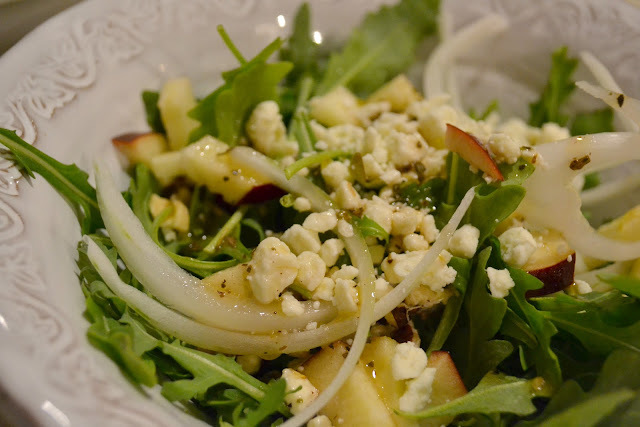 Simple and healthy ... our favorite way to eat! Ooh, these sound so yummy! Definitely trying the chicken piccata and the grapefruit salad. The salmon cakes look awesome! This looks delish! 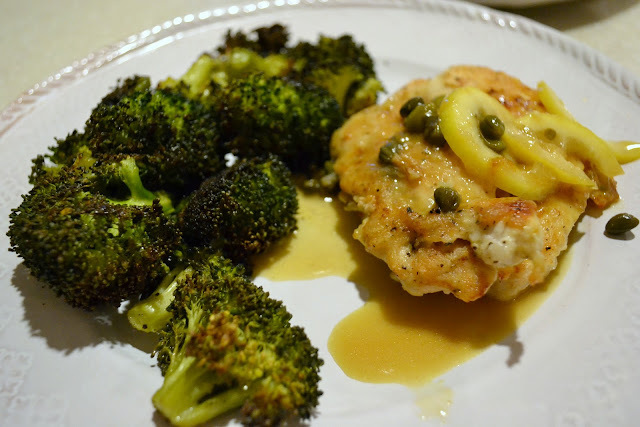 I love salmon patties/cakes and capers, so both dishes are right up my alley! Justin says he doesn't like Salmon but I am going to serve these and see what he says :) I always roast my veggies like that too, simple and yummy! 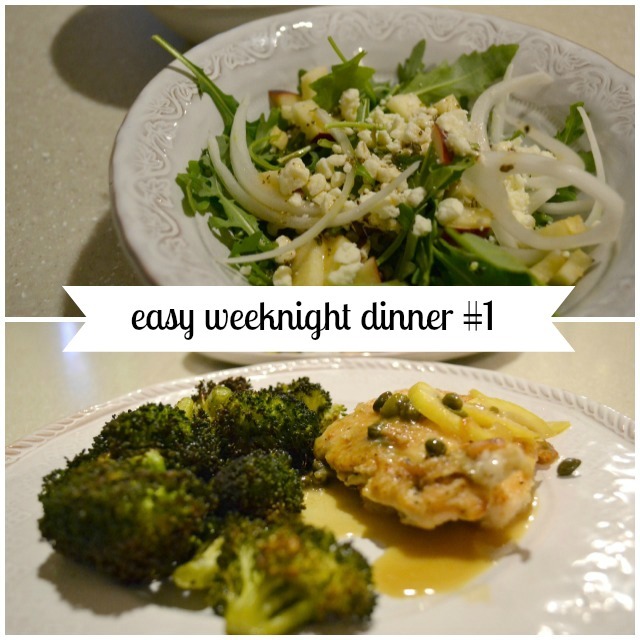 I am loving your easy weekday meal posts! 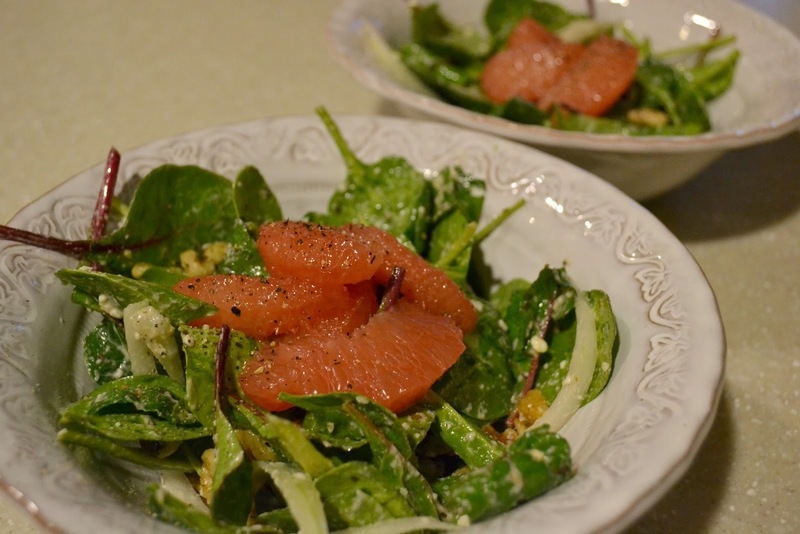 I am always looking for something that is fast but still healthy and delicious after work! 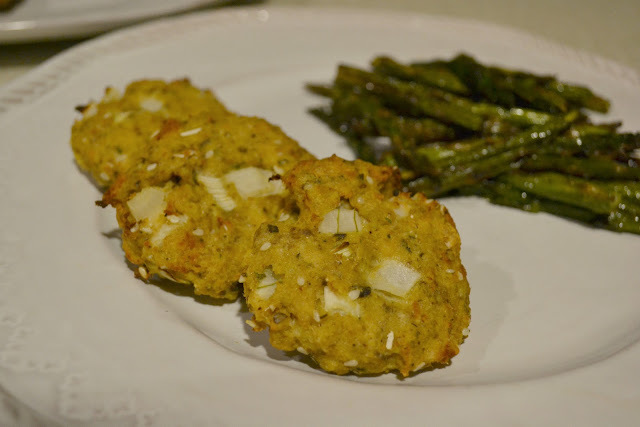 Last week I made the mashed white bean and rosemary receipe for my fiancee and I and we both loved it! It will def. become a side dish staple! I cannot wait to try the salmon patties and will have to keep a look out for this truffle oil! Those salads look AMAZING! I've been looking for more creative ways to eat salad, can't wait to try those two. You will be delighted to know that truffles and anything truffle related are super cheap in Italy! I still haven't tried the mashed canellini beans, but I promise I will! I love all your cooking posts -- come cook at my house please! 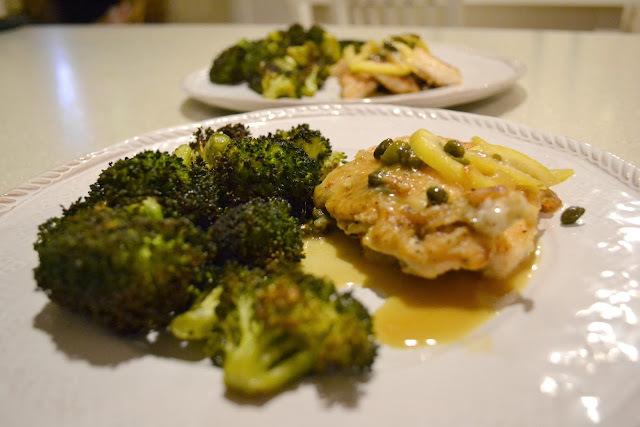 I had to tell you that I often search for this post - your chicken piccata has been a favorite of mine for years, & my husband now loves it, too!